With Sky: The Musical underway, thought it was time for the song list from the previous musical. A reminder that Act 2 (of Sky) is Tuesday at 9:30 pm (Eastern US). See the Hear Ye page for more information. Compared to other musicals, Dance: The Musical was short – only four acts. From in-the-title keywords as dance, dances, dancing, dancers, compound words with dance, to types of dances, the contributors to this blog provided 165 songs. This is a wonderful list, thus perfect for a playlist. Enjoy the list … and thanks for participating to make Dance: The Musical a smashing success. Whether as a ritual, a tradition, or the sign of the times, dance is an expression that crosses many cultures. Dance is social, ceremonial, and competitive. Whether at a club, in a ballroom, on a gymnastic mat, in water, on a stage – dance is personal – dance is fun – dance is energy on display. Dance expresses and it entertains. From the time we are babies bouncing along in someone’s arms or on a lap, dance has played a role in everyone’s life in some way. 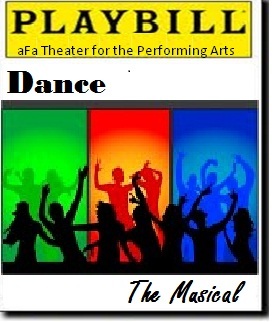 Dance: The Musical aims to capture the essence of this activity that brings joy to many. There are many forms of dance – the formal, the trendy, the cultural, and more. Whereas previous acts focused on different aspects of dance, Act 4 is about the dance – but not “dances”. Although dances is in the title, dances is not the keyword for this act – actually, it should not be used. This act is about the name of a dance. Beware of 2-word dances as Square Dance. This requires both words together, thus not automatically qualifying square or dance. Welcome to the closing act for Dance: The Musical. You, the audience have helped gather 112 songs in the previous 3 acts. A toast to your efforts, but now you face the greatest challenge in aFa Productions history. Our theme is The Dances, and the guidelines are stated above in the program. Because many possibilities exist, we hope to see performers from Strauss to Chubby – from Offenbach to Lou Bega – from The Diamonds to Baauer – from Freddie and the Dreamers to Rufus Thomas. The production team went gone back to 1989 for the opening act. Although a worldwide hit, this song and dance (the lambada) was most popular in Latin America. Some of you may not know the song or the dance, but that doesn’t mean you won’t enjoy it. Let’s hear it for Kaoma with The Lambada. Dance is a rhythmic action to music, but it’s also an event where the action occurs. Then again, from the time we most-likely first danced on someone’s lap, one can dance anywhere – around the house, down the aisles of the grocery store, or wherever one desires. (EX) Dancehall is an acceptable compound word,but happy dance is not acceptable because it is not a compound word. Special Note: Next week’s Act 4 will be tricky, so plan ahead by visiting the Hear Ye page, then (if needed) ask questions. For opening acts, we at aFa Productions tend to go with classic artists or surprises. This time, even we surprised ourselves with our choice. Then again, this was a chance to demonstrate the exception in the rules. The date was 1984, so some in the audience may recall this group from watching the early days of MTV. Ladies and gentlemen, welcome Wang Chung to the stage with Dance Hall Days. Those who do it well, dance with style while expressing a message. For others, dancing is a fun activity because it brings them joy. Act 2 features songs with Dancing or Dancin’ in the title. Caution: No duplicate songs, which includes the same song by a different artist. No matter the skill level, dancing is an expression for the dancer. Opening an act with an instrumental, but Act 2 is about dancing. Ladies and gentlemen, we couldn’t pass up the opportunity to honor a dancing legend for the opener. Enjoy not only Dancing in the Dark by Ray Conniff (which is from the movie Band Wagon), but also the expression by Cyd Charisse and Fred Astaire. Whether as a ritual, a tradition, or the sign of the times, dance is an expression that crosses many cultures. Dance is social, ceremonial, and competitive. Whether at a club, in a ballroom, on a gymnastic mat, in water, on a stage – dance is personal – dance is fun – dance is energy on display. Dance expresses – Dance entertains. Dance: The Musical starts with dance – that is all songs must have Dance in the title. Caution: Other forms of the word (dance) as dancer, dances, dancing, dancin’, dancefloor, dancehall, and any other form of the word are excluded from this act. Welcome to Opening Night of the latest aFa Production – Dance: The Musical. High school dances on the weekends were big back in my day. In honor of those days in my past and for your opening entertainment – ladies and gentlemen – it’s time to Dance to the Music with Sly and the Family Stone.